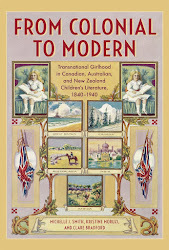 People sometimes comment on the academic study of children's literature and childhood as if it is a frivolous pursuit with no potential to tell us anything about history or culture. It would no doubt make some people gasp to know that some scholars even study children's toys. 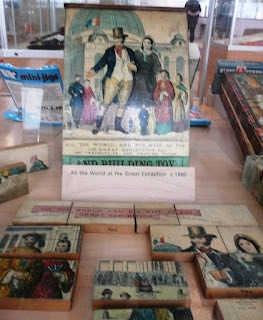 The toys in this post are part of the current V & A Museum of Childhood's exhibitions, and I've chosen them because of what they might reveal to us about the British Empire. People don't tend to think of toys as carrying any particular meaning, perhaps apart from gendered ones, but the toys of the past record many complicated ideas, even if unintentionally. 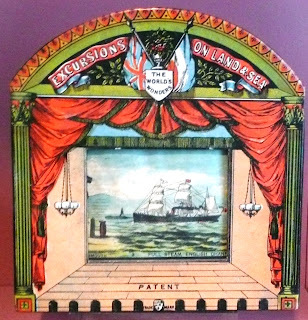 The panorama pictured above is designed to look like a toy theatre. The child would roll a long piece of paper along so that its movement gradually reveals a story (a candle could be placed behind the paper to add extra drama to the scene). 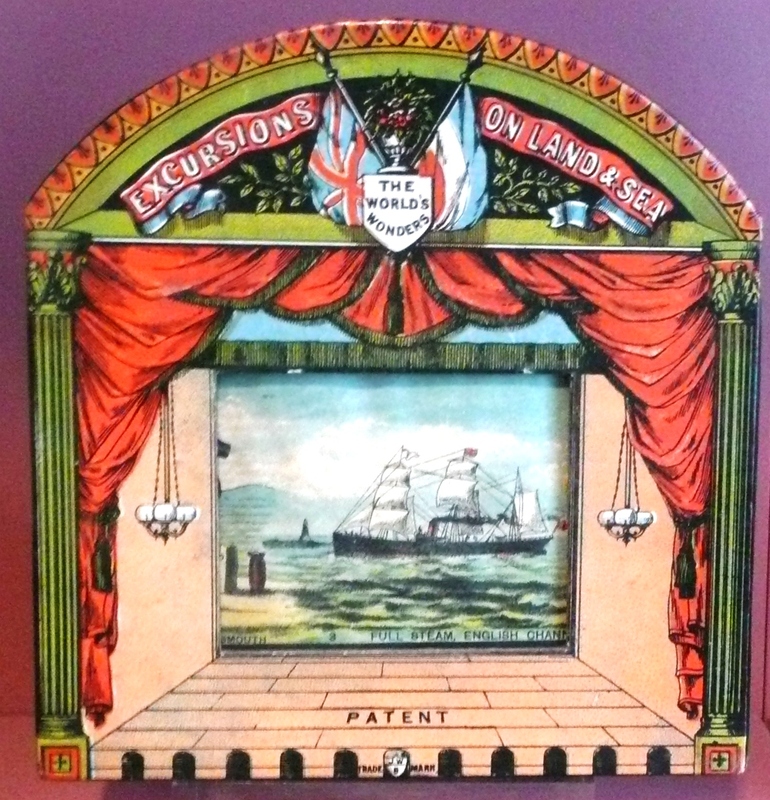 This panorama bears a crest with the words "The World's Wonders", encouraging the toy owner to see English shipping--in this frame the ship is "full steam" across the English channel-- as a modern marvel. Without being able to see the full roll and with little knowledge of Europe in this period, I am still a little mystified as to why the Pan-Slavic flag sits alongside the Union Jack. It was seagoing ability that made global exploration and colonisation possible. 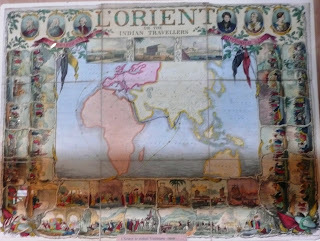 The L'Orient board game shows three different sailing routes to India, with the watchful eyes of British monarchs from George I to Queen Victoria running across the top. While the rule booklet for this game has been lost, the V & A speculates that players would use a form of spinning top (teetotum) to advance around the squares, with a requirement for the player to match the situation illustrated in each square with the ruling monarch of the period. TheAGreat Exhibition of 1851 was the first World's Fair (today known as world expositions) intended to exhibit milestones in culture and industry. 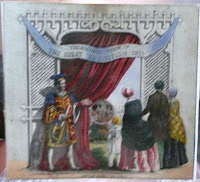 The 'Crystal Palace' exhibition, as it is also known, primarily sought to show British achievements and those of its colonies such as Australia, New Zealand and India, though there were exhibits from European nations.The telescopic panorama of the Great Exhibition allows a child to peer through nine layers of card to take in a somewhat three-dimensional view of the Exhibition. 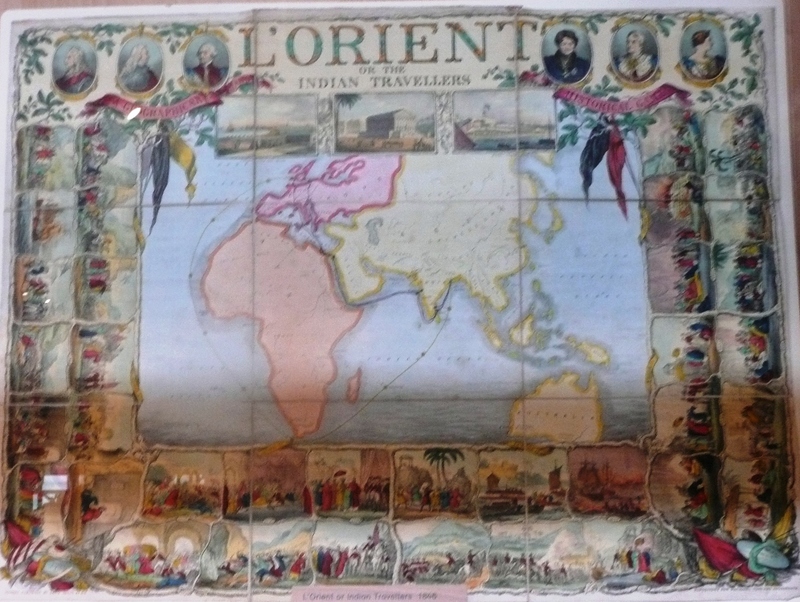 The ongoing significance of the Great Exhibition in Victorian Britain is evident in the continuing production of products celebrating and recalling the event, such as this puzzle from around the 1860s. The guide picture that shows the child how the puzzle ought to look and the puzzle itself include the caption "All the World and His Wife at the Great Exhibition." The caption is a little unclear to me. Does it mean that the male figure, presumably English, represents "all the world", and his wife has no connection with the imperial realm of trade and industry? Or are the other figures represented, including those in Asian dress, being acknowledged as part of the fabric of that world? 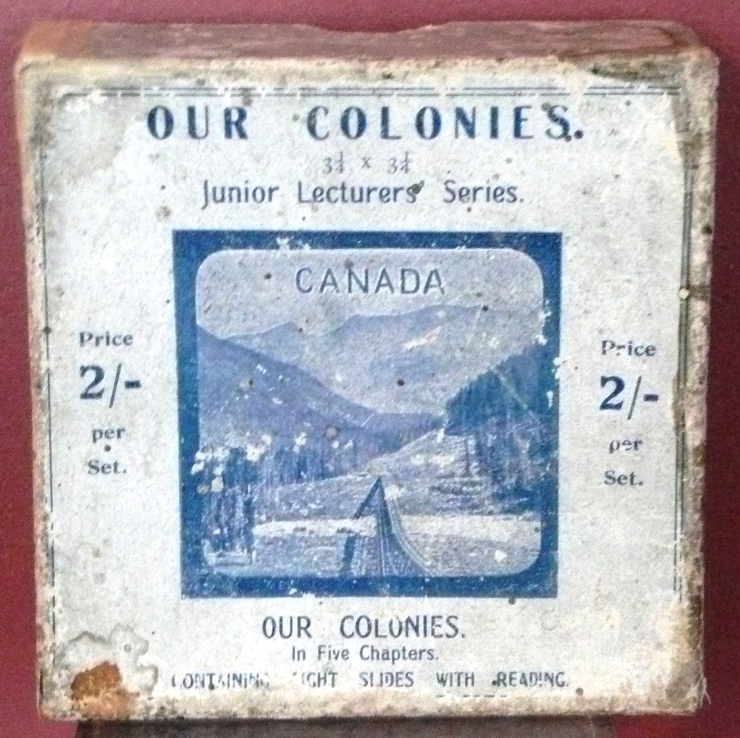 The importance of the colonies is evident in a set of 'Junior Lecturer' slides that were produced from 1900-1910 in order for British children to become acquainted with the geography and peoples of places such as Canada and South Africa. The possessive title encourages children to see that these countries belong to them as British people. 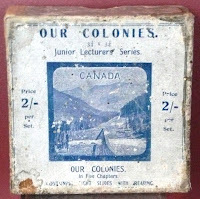 As good citizens of Empire, children ought to acquire knowledge about common practices in the colonies, just as the first explorers and settlers observed, categorised and documented these "new" lands. I always think the seemingly frivolous is likely to be more enlightening... you just have to look harder. Thanks for sharing your discoveries! Ah well, that's a nice way to think of it. If you work on children's texts you do have to learn to look harder. I think there's something to be analysed even on a cereal packet- must be the influence of the Cultural Studies subjects I took in my undergrad years.